This entry was posted on Tuesday, September 1st, 2015 at 12:27 pm and is filed under Uncategorized. You can follow any responses to this entry through the RSS 2.0 feed. You can leave a response, or trackback from your own site. Hi Barton, when can we buy XPS 13 developer edition again in Spain? Dell is selling it in USA but not in Europe, why? Thanks for your time. Unfortunately Europe has already run thru their forecasted inventory (they sold better than we expected). The US still has inventory on hand. Because there will be a next gen coming out we wont be getting any more of this model. Thanks for the information Barton. I’m waiting to buy two of them when they’ll be available again in the next gen. Given that I don’t care about warranties, do windows and developer editions have the exact same hardware? i.e. : If I buy a windows machine and load it with Ubuntu, would I get the same result as a developer machine? Is that going to be like “sometime Q2 2016” or like “next week” :-). Because if we’re talking 9 months I guess I’ll have to get the third best laptop on the market; whatever that is. Can you give us an estimated release date for the new gen? @Martin, unfortunately i cant give a time at this point. that being said, @Senji, it should be sooner that 9 mos 🙂 stay tuned! I’ve a xps 13 9343. not dev edition, but i suppose it’s exactly the same hw. is there an ISO of ubuntu with included all the drivers for this xps? @mavdi Yes they are the same hardware. However, I am having issues with my machine (dual booting win8.1) and strongly recommend you listen to Barton and wait until the next gen is released. Unless you plug in usb keyboard/external mouse the current gen machine is almost unusable with the open bugs. @barton Thanks for the wifi fix – trying now. Any update on the keyboard jumping? Thanks. I think I will wait. I sort of need a light linux machine urgently buy I guess I can still use my old mac. Please be a bit more agressive about getting a Intel Wifi module for the next generation. Maybe Broadcom costs 30cents less or gives the person making the contract a bottle of the finest Whisky out there, but in the end you need to put too many valueable time ressources into this on your end and the customers end. Are we going to have same day availability of the Skylake developer edition or do we have to wait several months after release? I own an XPS developer edition (last version out from europe) and think is a nice machine, however ubuntu still has issues (keyboard, touchpad, display port, etc..) and i’ve just read dell is going to make a new version of it already.Do you know if the support for XPS13 2015 will continue in the future? With ProSupport, support will definitely continue with the current XPS 13 developer edition. Too bad the only option to buy a decent Dell linux laptop with Ubuntu at this point is the M3800, which equipped with Ubuntu is more expensive than equiped with Windows, and when compared to equally equipped XPS15 is almost 700 EUR more expensive for the same hardware (except for the graphics card, which many don’t need). The result is that people will still buy Windows laptops and install Ubuntu by themselves. And the sales numbers will not back the results of the great project Sputnik. A pitty because we really want Ubuntu laptops. I have ordered one DE for me in USA , It will be delivered next week. is it coming all these fixes or should I do it manually ? When you run your updates the fixes will be delivered. …and now I feel like an ungrateful fool. 30 seconds of googling, and I was able to get her going by blacklisting i2c_hid. Thanks to you and the whole sputnik team for all the work you do. I was seeing my XPS 13 occasionally die when attempting to resume from suspend. The log fingered the Broadcom wireless module as the problem. At the time, I had the wireless gizmo disabled by the keyboard switch. This updated driver seems to have solved the problem. Would you and your team release an XPS 15 developer edition? Please. One of those with integrated graphics would make the ideal developer machine many of us dream about. Thanks for this writeup! It immediately resolved the crashes I ran into on 15.04. 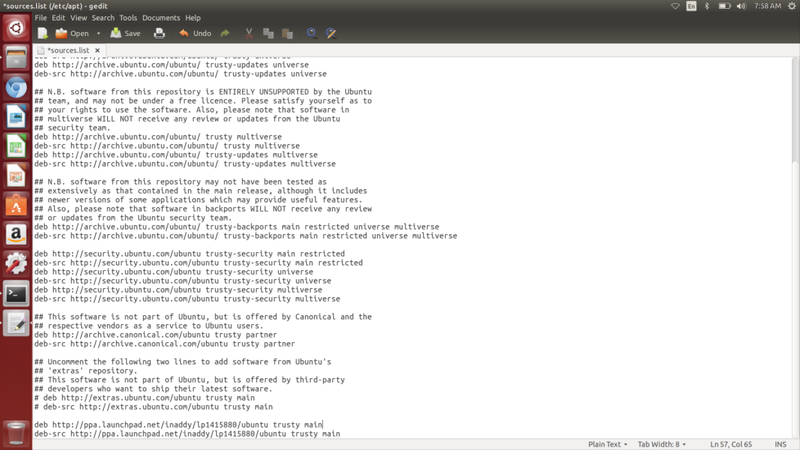 Barton, the fix you link to is up for SRU for official inclusion into Ubuntu, which would make everyone’s lives easier (e.g update rather than install new PPAs). Looks like the bug could use some verification from some users! Please encourage folks to go test the proposed packages so the fix is included in the repos.